A Side-By-Side Comparison of Stamped Concrete and Pavers | Diamond Life Real Estate, Inc.
Because of its unique texture and variation, stamped concrete is generally more ornate and typically ranks higher on the “wow” scale, and a wide variety of patterns and colors are available. With so much potential for customization, stamped concrete can imitate natural stone or segmented paving. Concrete is very mobile, so colors can be hand blended on site in addition to the color that’s added to the concrete mix. It can also be sealed for added protection from the elements and pool chemicals. The initial cost is somewhat high, not to mention the cost of repairs and ongoing maintenance can get very expensive because of New England’s notoriously irregular climate. It can be difficult for a DIYer to install, and it may require a professional installer. There are some in our industry that say there are only two kinds of concrete… “Cracked and Gonna Crack,” especially in Connecticut where we have a lot of freezing and thawing. Control joints and saw cuts are necessary to help control where the concrete cracks. They are sometimes made across the stamped pattern lines, making a mess of that ornate style you love. There is also the possibility for deterioration from de-icing salts. The sealer needs to be reapplied every year. Colors will fade over time. Pavers are generally thicker and more durable, so they won’t crack – when installed correctly. 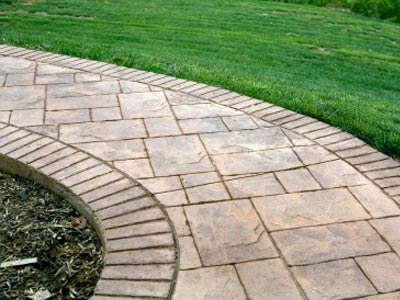 Pavers cost about the same as stamped concrete – depending on the application. The cost efficiency over time is very low. They usually do not need to be replaced. Repairs are easy and seamless, and involve simply replacing broken or cracked pavers. 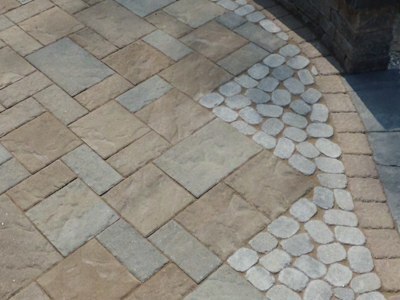 Paver patterns and colors can be mixed and matched to create striking designs with accent borders and bandings. Joint sand needs to be “topped off” every couple of years unless a polymer sand is used. Polymer sand is a sand that has a polymeric additive in it that binds and hardens the sand grains to each other and the pavers too. Weeds can grow between the pavers unless a polymer sand is used. When the polymer hardens, weeds cannot grow in it. Dye lots can vary from pallet to pallet – so if care is not taken when installing, a large area can appear blotchy. A skilled installer will know how to blend the pavers to eliminate this issue. Pavers can settle and move over time if they are not installed properly. Here in Connecticut, we have to ensure that everything – the existing soil, the base material we bring in, the pavers after they’re installed… – is compacted properly or the pavers will heave unevenly with the frost. As you can see, there are pros and cons to both stamped concrete and interlocking concrete pavers. I think it comes down to personal preference.